Some of the members of ARO who attended the dialogue with members of the public on the 2nd September 2018. On the 2nd Septemeber 2018, African Reclaimers Organisation (ARO) introduced itself to the broader public as the first organisation of recyclers that united those who work in landfills and streets. 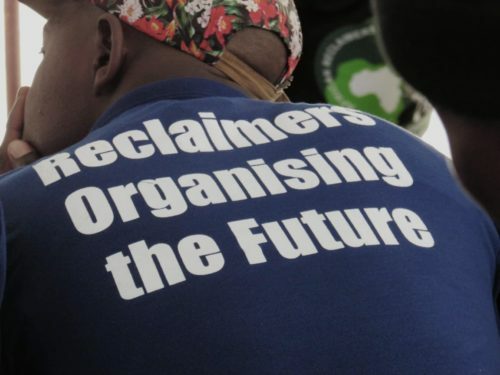 The reclaimers decided to frame this organisation as african because it incorporates all those who are engaged in the recycling trade regardless of their nationality. 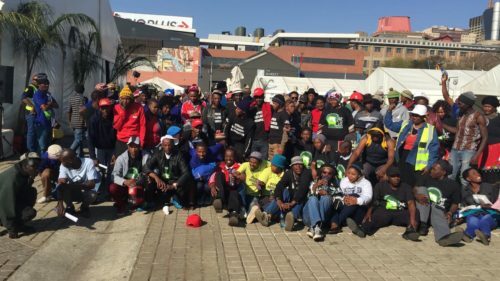 ARO started life as the Interim Johannesburg Reclaimers Committee (IJRC) and was formed initially to respond to the City Of Johannesburg’s decision to displace informal recyclers who collect in the streets by paying private companies to collect recyclables from High-income areas in the city. The City pays these companies to do the work that reclaimers do for free. After repeated appeals for discussion on the then proposed tenders and the possible effect they would have on livelihoods of thousands of people who depend on collecting, transporting, sorting and selling recyclables, the city continued to sign contracts with two private companies. Recyclers were forced to call the first-ever march of the landfill and street recyclers in 2017. We managed to stop two of the contracts, however, another two were signed. The effects of these contracts have been devastating to incomes of informal reclaimers. Their incomes have declined by over 60% in all areas where private companies were introduced. Research by the Council for Scientific and Industrial Research (CSIR) has shown that close to 90 000 South Africans work as informal recyclers collecting close to 90% of all materials that is recycled. South Africa is ranked third behind countries such as Sweden on its recycling rates. These impressive rates are almost all entirely due to informal recyclers who form the foundation of the recycling economy but often ignored by policy-makers and industry. ARO wants to change all this. We want South Africa to increase its recycling rates and for informal recyclers to be paid for the free labour they provide, which is the foundation of the recycling economy worth hundreds of million of rands. We collect, sort, transport and sell materials, saving the state and private industry millions and extending the life of landfills. We perform a vital environmental service, removing thousands of tons of discarded materials every year. Amongst us are university drop-outs, former teachers, ex-mine workers, ex-offenders looking to make an honest living, young people, older people and the precariously employed. Most of us are not looking to be employed by government or private companies, we just want to make a living and be self-employed. We also want to work with residents to make ourselves known as people who share your streets and also want to remove the stigma that our work brings. We are not drug addicts, most of us are men and women with families who work hard to make a living. We support our children to fund their schooling, we feed and clothe them and we never collect waste. We collect that which is of value but is discarded by many in society. We look forward to meeting residents, industry and government and to make our struggles and contributions to society is known. With ARO we are no longer in the shadows and we look forward to meeting you. A member of ARO from Village Main Station, listens carefully during the dialogue that Reclaimers held with members of the public at Jozi Book Fair on the 2nd September 2018.